The companions of Corinthian Chapter No 2350 and their guests were most pleased to welcome the Deputy Grand Superintendent Paul Renton to the installation meeting at Hindley Masonic Hall. He was escorted by Paul Hesketh, the Provincial Grand Director of Ceremonies. 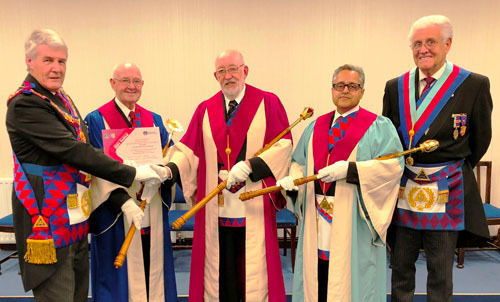 Paul Renton was accompanied by fellow grand officer, Malcolm Warren, who is the Regional Charity Steward, and by the Provincial Scribe Nehemiah David Case, together with Provincial Grand Steward John Selley, who is also the Wigan Group Vice Chairman. Chapter members Geoffrey Porter, the group chairman, and Christopher Reeman, the group secretary added their support. Presenting a festival certificate, pictured from left to right, are: Paul Renton, Eddie Atherton, John Seddon, Roy Kholi and Malcolm Warren. The three principals, George Cunliffe, John Seddon and Eddie Atherton, delivered a ceremony of the highest standard. They were ably assisted by Alan Johnston, Jonathon Lever, Ryan Mangnall and Malcolm Keeling who delivered the appropriate readings. The newly installed team consisted of John Seddon who progressed to first principal, Eddie Atherton to second principal and they were joined by new boy Roy Kholi as third principal. The robe addresses were delivered by Ken Wilson, Ray Pye and Neil Whittle in a most impressive manner. With the new officers appointed and invested the Deputy Grand Superintendent brought the greetings of the Grand Superintendent Tony Harrison, congratulated all concerned and expressed his congratulations to the companions for the work they must have had to put in to deliver such an impressive ceremony. He expressed the satisfaction of all the companions present at being present to witness such a fine ceremony. The first principal John Seddon, having thanked the Deputy Grand Superintendent for his kind comments, presented him with cheques in favour of the Masonic Charitable Foundation 2021 Festival, West Lancashire Freemasons’ Charity and Hindley Masonic Hall. Paul was delighted to be informed by Malcolm Warren that the further donation to the Festival just received, meant that the chapter qualified as a Patron of the Festival and he was pleased to present John with a certificate to that effect from the Province. At a happy and vibrant festive board, Paul urged the companions present to encourage those who were not yet members of chapter to consider taking the step to complete their pure ancient Masonry. He believed they would find it enjoyable, vibrant and stimulating. He thanked those members of the hall management team for their hard work in keeping the hall in tip-top condition. He was also pleased to see so many of the companions wearing their festival jewel ‘with pride’. Before leaving for home, John presented Paul with a beautiful bouquet of flowers for his wife, Wendy. Corinthian Chapter looks set for another successful and happy year under the leadership of its new team. Pictured from left to right, are: Paul Renton, Eddie Atherton, John Seddon, Roy Kholi, and Paul Hesketh.